There is no general method for creating openings that can be applied for all the different types of roofs that are encountered. 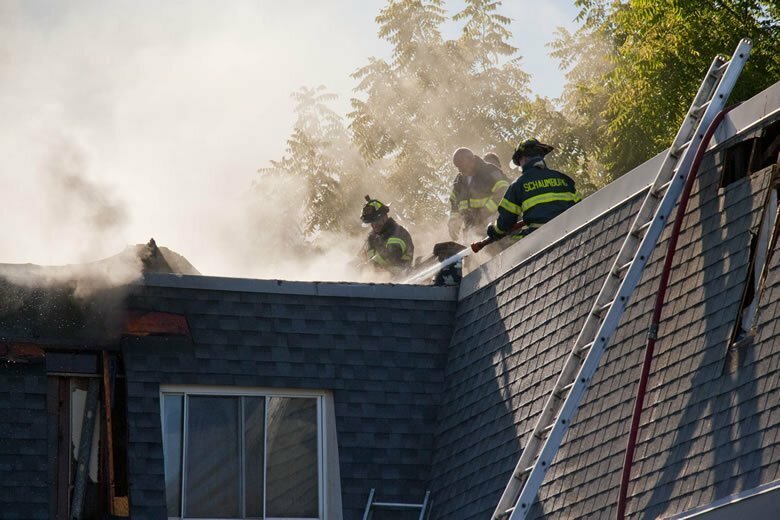 More simple roof structures with a framework of wood or metal can often be dealt with relatively easily during a fire ventilation operation, while roof structures that contain thick concrete or steel must be considered to be impenetrable in such contexts. Nevertheless there are tools that can cut through concrete, for example the hydraulically powered eccentric cutting machine. Creating openings in such materials does take a long time, and is therefore only applicable in very special situations. If fire ventilation is to be worth the effort it is essential that both the outlets and inlets are sufficiently large. The size of the fire and the premises are the determining factors, but for an outlet 4–8 m2 can serve as a guideline. It takes time to create openings for fire ventilation, and regardless of which method is chosen and used the time factor must be taken into consideration. The fire develops and changes over time, and this means that the situation could be completely different when the openings are ready from what it was when the work was started or a decision was made. The fire and rescue operation must be coordinated if fire ventilation is to be successful. The team participating in the operation should be experienced and trained in the use of the tools and the methods applicable for creating openings in different roof structures. At least two, or preferably three persons should be available for this purpose. The size of the fire, the type of roof structure, and the choice of tools/method will nevertheless determine how many persons are needed. The safety aspects must also be taken into consideration, and will be a decisive factor as to how the work should be done, or if it can be done at all. A few examples are given below of openings that can be made in different types of roofs commonly found in Sweden. It is a good exercise to make an inventory and to go through the different types of roofs/structures that may be encountered in fire and rescue operations. It is also important to bear in mind that the actual opening should be made in such a way that there is always a safe escape route, as described in the last chapter. The first cut in a roof should be made away from the work platform (ladder or ladder truck), so that the last cut can be made while standing on this work platform. The opening is made between the roof trusses. On roofs with seamed metal sheeting it is difficult to see where the roof trusses are. On certain buildings they may extrude at the base of the roof. There is often metal jointing or other metal objects just beside the roof trusses, ridge and base of the roof. Leave an edge of one to two decimetres from these. To make an opening for fire ventilation the seamed metal sheeting can be penetrated in different ways. One way is to cut it by means of a power cutter, and if the power cutter is powerful enough it will also be possible to saw through the roof boarding at the same time. For the power cutter to work effectively it must be run at full speed. It should work its way through on its own, without using excessive manual force. If the roof boarding is not removed at the same time it can be sawn when the metal sheeting has been removed, for example with a chainsaw or circular saw. One advantage of removing the metal sheeting first, and then sawing the roof boarding, is that the nails become exposed at the roof trusses, which makes it easy to locate the roof trusses. Another method of removing the metal sheeting is to knock up the seams with a club or a large hammer. Once the seams round the sheeting have been knocked up, it can be lifted or pulled off. If the sheeting jams so that it is difficult to remove, an extractor tool can be used. The sheet metal extractor’s chain can be fi xed in the lever basket so that the metal sheeting can then be lifted off with the lever. The roof tiles are removed from the place where the opening is to be made. The opening is made between the roof trusses, with a remaining edge of about two decimetres to the roof trusses, ridge and base of the roof. The location of the roof trusses is easily determined on structures where they protrude from the base of the roof, otherwise the nails can be exposed by removing the roofing felt. It is also possible to determine the location of the roof trusses by tapping with a hammer on the roof boarding and listening to where it sounds most hollow. Once the tiles are removed the opening can be made by sawing through the roof boarding with a power cutter, a chainsaw or a circular saw. The easiest thing is to start at the ridge, and then saw the edges of the opening and finally along the base of the roof. A jimmy or crowbar is often needed to remove the roof boarding and battens completely. Loose tiles pose a special risk with tiled roofs, and can drop down on personnel standing on the ground or on a ladder. In the case of an intense fire roof tiles can be blown off, and therefore personnel, vehicles and equipment should be placed at a safe distance from the building. The roof tiles that are removed should be placed on the ground. On older buildings the roof tiles may be attached to the battens or roof boarding with a cut-off nail that sticks out one or two centimetres. When the roof tiles have been removed it is easy to injure oneself on these nails when making an opening, or when balancing oneself against the roof. Tarred roofing felt can be laid on mineral wool boarding, roof boarding or the like, and can be difficult to identify from the outside. Below this there is often insulation, and below the insulation the supporting structure. This can be roof trusses, or corrugated metal sheeting laid on steel girders (see next section). It can be difficult to get through tarred roofing felt. If a chainsaw is used the tar can cause the chain to stick. 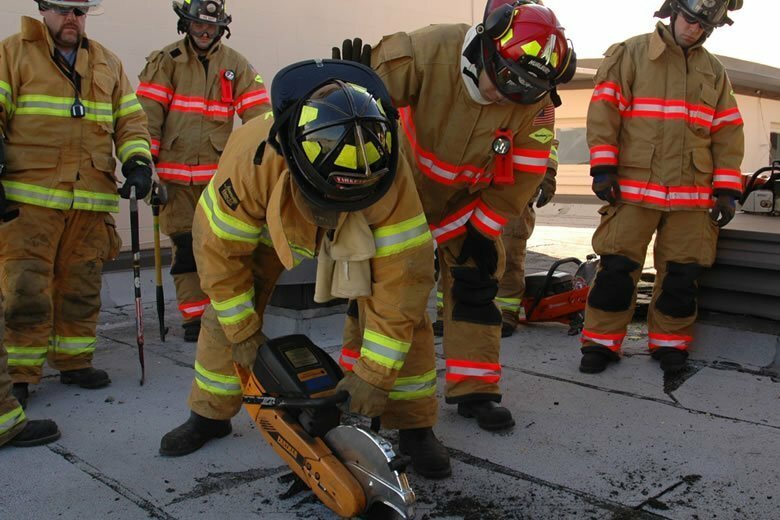 A power cutter with emergency blade can manage to cut through,but to avoid the problem the tarred roofing felt can be removed with a scraper where the cuts are to be made. Make an opening in the surface under the roofing felt, and remove the insulation. The location of the roof trusses or the supporting girders can then be determined. In such a structure the interior metal sheeting provides the support and is laid on steel girders. To make an opening for fire ventilation both the outer and inner profiled metal sheeting must be cut through. The outer profiled metal sheeting is often not as deeply profiled, and can therefore be sawn with a power cutter. Another alternative can be to use a sheet metal extractor, but this assumes that the attachments can be broken without using too much force. Perhaps the easier way of removing the outer profiled metal sheeting is to use a screwdriver. The fastenings can be removed with a battery operated drilling machine fitting with a fixed socket or a screwdriver bit. The sheeting can then easily be removed and lifted down. If the sheeting is fastened with screws it is relatively easy to make a large opening in the outer roof. Saw two parallel slots across the grooves of the sheeting. The space between them should be wider than the power cutter. Press down the sheeting between the slots. Saw the sheeting in the bottom of the grooves. Do the same thing on the other side of the opening. Saw the short sides of the opening up on a seam in the sheeting. If these slots are sawn first this increases the risk of falling through when the sheeting between the two parallel slots is to be pressed down. If the sheeting is fastened with screws to each other and in the girders, it can be relatively easy to remove a complete sheeting instead of sawing up the opening. Special problems with this type of roof include melting tar from the tarred roof base paste board running down in the bottom of the grooves in the sheeting. If the roof is also at an angle the fi re can therefore spread under the insulation. The roofing felt and insulation should therefore be removed a good bit from the ventilation opening. If the roof is so hot that the tar melts before an opening has been made for fire ventilation, an opening should be made instead to prevent the spread of the fire in the roof structure. Bear in mind that tar runs quickly, and also that the separation at fire compartments limits beneath the metal sheeting may not be very well executed on this type of roof. In industrial buildings there are often so-called smoke vents. They are normally designed to allow fi re gases to escape by means of its thermal buoyancy force, and can be designed as cowls with shutters or as light apertures. The vents are opened automatically or manually during a fire. If they open automatically they will either by connected to an automatic fire alarm, or there will be a fusible plate. The fusible plate consists of two soldered metals that will melt at a certain temperature, whereby the vent opens. In older buildings there can be a nitrated wire instead of a fusible plate, which burns off at a relatively moderate temperature. Neither fusible plates not nitrated wires are particularly common. In cowsheds and stables the smoke vents can consist of plastic sheets (light apertures), which are intended to be burned through at an early stage of the fire. Smoke vents that are opened manually can be opened by means of a switch/knob, for example in the fire alarm central. The shutters on the smoke vents are kept shut be means of magnets, and open when the power is switched off. Another alternative is that there is a handle on the vent, connected to a locking device. The shutter is opened by turning the handle. A completely manual shutter, often in the form of a light aperture, must be opened by removing the securing plate and lifting the shutter off. In this case a hammer, screwdriver or jimmy (crowbar) is often needed. facilitate the fire fighting operation. The possibility of using mechanical ventilation systems as an active part of the structural fi re safety in buildings is limited by the type of building. A building with a large number of small and separate rooms is less suitable. On the other hand the method is feasible for covered yards, shopping malls, assembly halls, industrial workshops or warehouses. Two principles are normally used in these systems: pressure relief and pressurising, often in combination. Pressure relief is normally a measure directed towards the fire room, for example in large areas such as assembly halls and industrial buildings. Pressure relief takes place by opening one or more shutters or windows so that the fire gases can fl ow out (see section above on smoke vents). Another solution is that pressure relief is done through separate shafts. Both shafts and shutters (smoke vents) can be fitted with a fan resistant to high temperatures, which starts when the system is activated during a fire. Pressurising can be used as an alternative, or supplement, to pressure relief. This measure is used in adjacent areas, for example evacuation routes (stairwells, corridors and the like). The main purpose of this measure is to facilitate evacuation and the fire and rescue operation. A pressurising system can be integrated with the comfort ventilation, or alternatively be implemented as a separate system. normal ventilation system is switched off. Stairwells are not always placed in connection with outer walls. The sectioning of evacuation routes can be simplified. Evacuation routes can be longer than normal. The number of stairwells can be limited. The system can make doors difficult to open or close. To facilitate evacuation it is important that the mechanical ventilation systems are started at an early stage, and for this reason they are normally connected to an automatic fire alarm. The system starts when a fire is detected. In certain cases, however, the system may need to be manually controlled, i.e. someone has to start the system with a switch or the like. Stefan Svensson works as a research and development engineer/instructor at the Swedish Rescue Services Agency. He started his career as a fire fighter in the Swedish Air Force in 1986, became a fire protection engineer in 1989 and earned his Ph.D. in 2002. Stefan is researching on the subject of fire fighting tactics. He has also worked for a number of years on fire ventilation, and has contributed to several works on manual high-pressure fire fighting.